Chris here: this is the first in a series of papers delivered at an MLA Convention panel called "Race and Critical University Studies," organized by Heather Steffen and me and held on 5 January 2019. Prof. Savonick gets at a key motive behind the panel when she says below, "Critical university studies puts a name on something that activists, intellectuals, and scholars of African American studies, women’s studies, and ethnic studies have been doing for decades and even centuries." We are interested in helping CUS contribute to the continuation and extension of these critiques and practices. 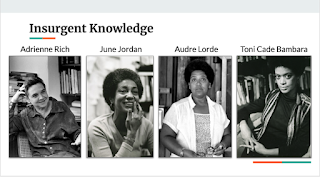 My remarks today are drawn from my current manuscript project, Insurgent Knowledge, which analyzes the literary and pedagogical praxis of Audre Lorde, June Jordan, Toni Cade Bambara, and Adrienne Rich. I’ll give a brief overview of the project and highlight one key example, then suggest some ways that this work might help us think about this panel’s question: how can critical university studies approach issues of race, racism, and racial capitalism in higher education? While Lorde, Jordan, Bambara, and Rich are most often studied for their literature, my project positions them as theorists of feminist and antiracist pedagogy. In 1968, at the height of the Women’s Movement, the Civil Rights Movement, Black Power, and protests against the Vietnam War (and the same year that Paulo Freire was writing Pedagogy of the Oppressed) these authors were teaching down the hall from one another at Harlem’s City College, in the Search for Education, Elevation, and Knowledge (SEEK) educational opportunity program and later during Open Admissions. Like the majority of educators today, they were not teaching wealthy or even middle-class students at elite universities with ample resources. Rather, they were teaching working class students of color in the nation’s first state-mandated educational opportunity program. 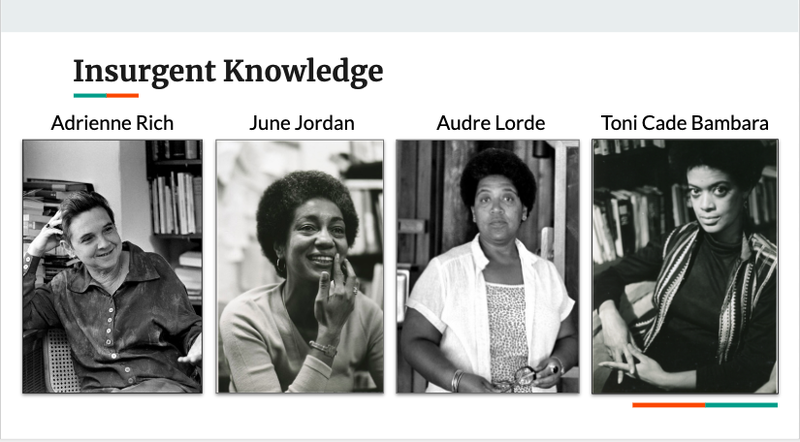 As educators, these authors drew on their poetic sensibilities to develop student-centered, collaborative, and consciousness-raising pedagogies that transformed their classrooms into sites of social change. They challenged students to make crucial decisions about the structure of their courses; to conduct original local research on poverty, housing, food, and education; to write and publish literature and to become teachers in their classrooms and leaders in their communities. These pedagogies were designed to navigate and contest the privatization of knowledge and power that has come to dominate educational practice, and I hope this research will help us to continue that work today. Given this panel’s focus on race, I want to say a little more to contexualize their educational activism amidst the racial politics surrounding CUNY in the late 1960s. Since its inception, City College has been understood as a barometer for educational democracy in the U.S. While the school had a historical mandate to educate “the children of the whole people” and had long boasted of being the “Harvard of the Proletariat,” it was not until 1965 that the SEEK program was established to address the fact that the college’s student body did not reflect the diversity of the surrounding Black and Puerto Rican Harlem community. SEEK recruited “economically and educationally disadvantaged” students and prepared them to matriculate at City College through remedial coursework. formed an insurrectionary pedagogical milieu committed to the success of working class students, first-generation students, and students of color. At this point, I am overwhelmed by the number of stories I want to tell you. I want to tell you how Bambara was tasked with teaching a remedial summer writing course that would prepare students to assimilate into the existing curriculum, but instead she challenged them to design their own course and equipped them with the tools to reinvent the university. I want to tell you about how Lorde assigned daily journals and collaborative projects to teach students to locate their lives in relation to long histories of institutional injustice. I want to tell you about Rich’s insistence that her university did not need a new, highly exclusive MFA program but desperately needed to offer a master’s in creative teaching in order to address the nation’s devastating conditions of educational inequality. But in the interest of time, I will focus on just one example: the praxis of publishing student writing. 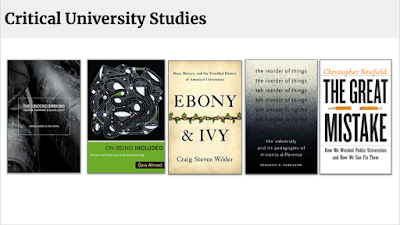 While these anthologies may be familiar to scholars of African American literature and women’s studies, today, I want to focus on the little-discussed fact that all of these relatively well known anthologies included student writing. 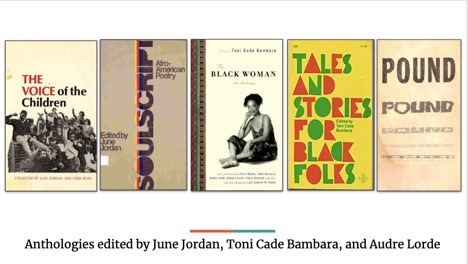 In fact, much of the writing in these collections emerged from the courses Jordan, Lorde, and Bambara taught at Tougaloo College, City College, Rutgers Livingston, and in less formal spaces, like weekend writing workshops. 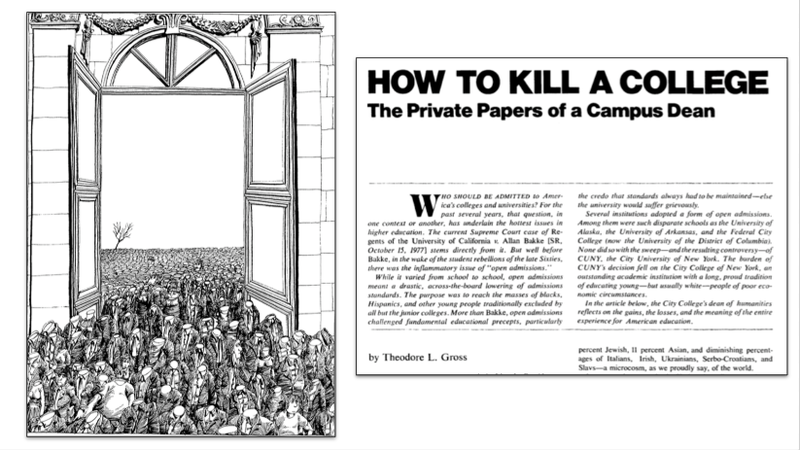 Instead of submitting writing solely to be read by the instructor, they organized their courses around the production of texts that could circulate in the world beyond the classroom. For example, The Voice of the Children is a poetry collection authored entirely by students in Jordan’s weekend writing workshops and published in 1970. Nine out of ten times when a person hears the word ‘ghetto’ they think of Black people first of all...Ghetto has become a definition meaning Black, garbage, slum areas... 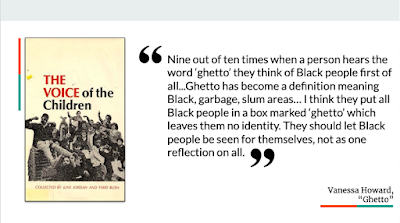 I think they put all Black people in a box marked ‘ghetto’ which leaves them having no identity. They should let Black people be seen for themselves, not as one reflection on all. By teaching her students that they were authors with important things to say, Jordan directly challenged the ways mainstream media pathologized working class students of color as deprived, disadvantaged, unruly bodies in need of discipline. I read these anthologies as the enactment of a social justice pedagogy developed by these teacher-poets. In contrast to the top-down construction of traditional anthologies, which are typically produced for but not by students in the classroom, Jordan, Lorde, and Bambara acted on a conviction that authorship — the power to move people through language — is widely distributed despite racist and patriarchal institutions that privilege the voices of a narrow, white male elite. The authors they worked with were low-income, women with families to support, people of color, and often students (some as young as 9) and the editorial labor that went into these collections ranged from convincing publishers that these authors had something important to say to convincing the authors themselves. As educator-editors, they put in countless uncompensated hours corresponding with publishers, negotiating contracts, and organizing publicity events. They did so because they understood the multifaceted impact these anthologies could make in people’s lives. 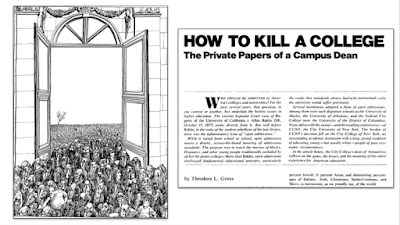 These publications helped students understand the power of their voices and share survival strategies across the partitioning walls of classrooms and institutions. They addressed the racism of both the literary publishing industry and academia and called out to collectives of readers who had previously been ignored by publishers. These anthologies were part of a grassroots movement for pedagogical, cultural, and social change that emerged not from top-down decisions by school boards, but led by writers and teachers embedded in city classrooms, who witnessed the pernicious gaps among existing curricula, the abundance of Black poetry, and the experiences of students’ lives. In doing so, they drew on a long history of Black self-publishing, which was central to both the Harlem Renaissance and the Black Arts Movement. And it was from these experiences of trying to publish their and their students’ writing that Kitchen Table: Woman of Color Press was born. Publishing student writing would become a central component of Jordan’s pedagogy for years to come, most notably in her Poetry for the People program at U.C. Berkeley in the 1990s, where she trained hundreds of students to write, publish, and perform their poetry and to become educators who would go out into community centers, homeless shelters, K-12 schools, and churches to teach others to write and publish poetry. Taking advantage of campus resources, Jordan insisted in students’ involvement not just in the co-creation of their classroom, but in the publication process: editing, proofing, binding, budgeting, distribution, and marketing. Reflecting on a course that concluded with a collaboratively-authored anthology, Jordan notes that “the class was producing its own literature: A literature reflecting the ideas and dreams and memories of the actual young Americans at work” (“Merit Review”). But anthologies are just one example of the collaborative, project-based, multimodal and public pedagogy developed by these teacher-poets. Rather than dictating the forms their final projects should take, Bambara often asked students to find or invent a form that would best tell the story of their learning and share these lessons with a public audience beyond the classroom. “Do not write term papers for me,” Bambara told students, “Make sure they are useful for somebody else as well,” suggesting forms such as a collaborative annotated bibliography, performance art, a short story (for radio or TV), a magazine, puppet theater, a street theater performance, a slide show, or a picture book. The one requirement was that it “can be shared with others.” Some examples of Jordan’s collaborative projects include a “Wrath Rally” and letter writing campaign against poverty in Biafra, organized by students in her Upward Bound Class, dramatic radio productions on children’s welfare and racial justice in South Central Los Angeles, and A Revolutionary Blueprint, a collection of reading lists, syllabi, poetry, and activities that turned the lessons of Poetry for the People into a “how to guide” for others interested in democratizing poetry. Through these assignments, these teacher-poets taught students that their voices, stories, and actions mattered for social change; in short, that each student, in Jordan’s words, “has much to teach America." As educators, we are accustomed to thinking about how our courses can be useful to students, but these teacher-poets urge us to consider how classrooms can also become useful to the world beyond its walls. Through this pedagogy, they taught students an activist way of being in the world, in which we do not sit idly by, but confront our complicity in, and therefore our abilities to address, problems in society. They believed that everyone has something to contribute to the production of a more just, equitable, and pleasurable world, and that classrooms were one site for discovering what that might entail. Often, this took the form of getting better poems and better books into the hands of readers who needed them. Through these assignments, they showed students their collective social power that neoliberal institutions cover over: how our learning, knowledge, writing, research, and art provide opportunities to fight for change. In a moment when conservative politicians like Ronald Reagan were demonizing activist students and calling art education an “intellectual luxury,” these teacher-poets were part of a groundswell pedagogical movement of educators who understood an education in language as a crucial skill for navigating and transforming the world. Best articulated by Audre Lorde, the study of language and literature — in community college, Open Admissions, and remedial writing classrooms; in community centers; in weekend workshops; and around the kitchen table — was never understood as a “luxury,” but as a way of improving “the quality of light by which we scrutinize our lives” (36[CJN7][ds8]), a necessary undertaking for those rendered vulnerable by the social order. What emerges from this genealogy is a humanistic praxis that is continually responsive to material conditions of inequality, what I am calling “the indispensable humanities.” The indispensable humanities interrogate how resources are unevenly distributed along embodied axes of race, class, gender, and sexuality, and the roles that language, literature, education, and culture play in perpetuating and altering these conditions. By way of a conclusion, I want to offer some provisional hypotheses/answers to this panel’s question. 1. 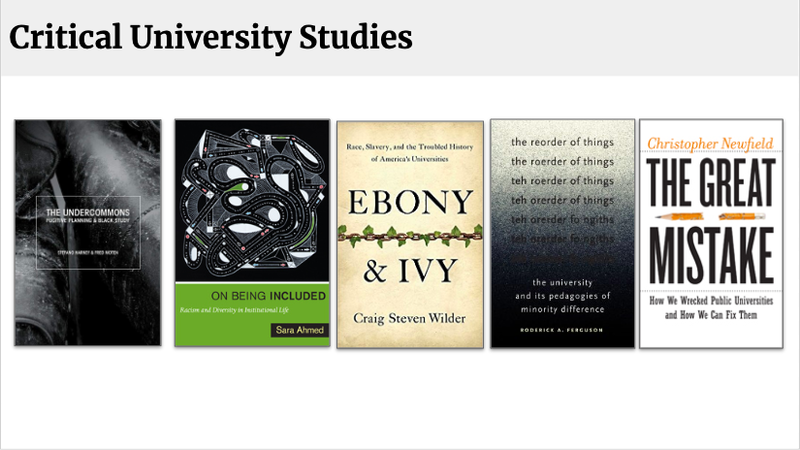 Critical university studies puts a name on something that activists, intellectuals, and scholars of African American studies, women’s studies, and ethnic studies have been doing for decades and even centuries. And so, a worthwhile project for critical university studies might be to locate our work within an insurgent genealogy that includes not only these-teacher poets but also figures like W.E.B. 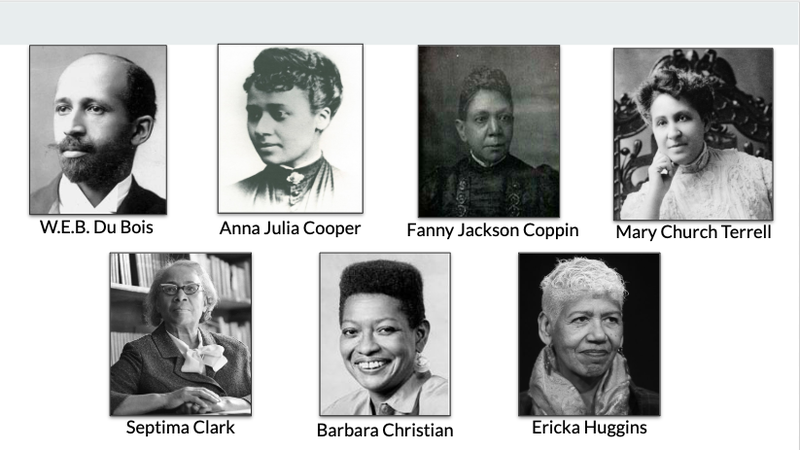 DuBois, Anna Julia Cooper, Fanny Jackson Coppin, Mary Church Terrell, Septima Clark, Ericka Huggins, and Barbara Christian. In doing so, we might better understand our contemporary moment as the product of much longer and ongoing struggles for educational justice. 2. Recent work in critical university studies has built on the legacy of these figures, analyzing how higher education often reproduces the conditions of inequality it claims to challenge, especially through longstanding violence against people of color. While these teacher-poets were, in Moten and Harney’s terms, “in but not of” the university, they also acknowledged how higher education remains one of the most viable paths towards the modest comforts of a middle-class life, especially for students from working-class backgrounds, and how absconding can be too risky for those without an economic security net. Instead, they used their knowledge of their complicity within unjust institutions to hold institutions accountable, redistribute educational resources, and make them more responsive to diverse communities. 3. With my research, I aim to position these teacher-poets as leaders of pedagogical, institutional, and social change, whose work points to the importance of fighting on all of these different fronts: from the page, to the classroom, to the streets. In our current moment, one in which racism operates more insidiously (for instance, as Sara Ahmed shows, through the proliferation of diversity discourses), I’m interested in how these educators taught students both to navigate conditions of structural inequality and to imagine and build better alternatives. In particular, their work reminds us that many contemporary student-centered pedagogies emerged in relation to the critiques of power issued by the feminist, antiracist, and anti-imperial social movements of the late 1960s. Their work demonstrates how our pedagogies can contribute to larger struggles for social justice, even from within conservative, hostile, neoliberal institutions (what Alexis Pauline Gumbs calls “counter-poetic” pedagogy). My aim is not necessarily to say that contemporary educators should do these exact things (although I’ve had a lot of fun trying) but to make available different ways of thinking about our classrooms as sites of social change, especially in relation to Black Lives Matter, the #MeToo movement, and other movements for social justice. It seems to me that professors of English, perhaps Humanities generally, maybe even non-sciences generally, use assumptions and terms ("jargon"?) that may be well-established or well-defined to them, but not to anyone else. As a result, they preach to the converted. "They challenged students to make crucial decisions about the structure of their courses; ..."
This seems as close as it gets. But no examples of challenges. Did they challenge "the structure of" their courses, or just their courses. what's the difference? "these authors drew on their poetic sensibilities to develop student-centered, collaborative, and consciousness-raising pedagogies"
This sounds just a little snobby: "if you are not a poet, forget it". How about "these authors aimed at student-centered, collaborative, and consciousness-raising pedagogies". AND THEN give SEVERAL examples. "my project positions them as theorists of feminist and antiracist pedagogy." I treat them as theorists of feminist and antiracist pedagogy. "an insurrectionary pedagogical milieu committed to the success of working class students, ...."
Lots of us wanted students like these to succeed but had no idea what "an insurrectionary pedagogical milieu" was. That doesn't make the phrase empty. Like many mathematicians, I had to learn that I could not teach my students the way that I was taught, or the way I learned best. It took years of reading, trial and error. An insurrectionary pedagogical milieu might have helped, if I knew what it was. "privilege" as a verb; I don't have an alternative but it's an important idea: someone should think of one. "At this point, I am overwhelmed by the number of stories I want to tell you." This paragraph helps me. But details would help more. btw, Did 14 year-old Vanessa Howard come up with all this herself? Right wingers will be sure she was told what to say. 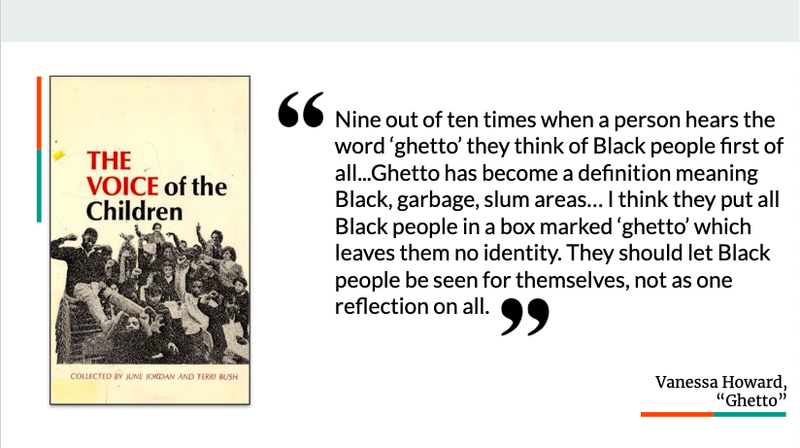 "ghetto" does indeed suggest Black people; but to me it more strongly suggests Jews; and more broadly Latinos, especially recent immigrants; and more broadly still, poor people, working or marginalized, of any color. "say a little more to contexualize their educational activism"
"countless uncompensated hours" how about "many". They are "countless" only because they are not recorded. I want to add a story told me by a white woman in Broome, North-Western Australia, who taught mainly Aborigine children there. Teachers would ask questions of the class. White hands would go up. Were Aborigines "dumb"? BIt turned out that Aborigine children often knew the answers (or good answers, for vague questions); they didn't raise hands because that would be "pushy" - you just don't show off in their culture. Many years ago, Paul Goodman wrote that we don't need any more books about how or what to teach; we need books of "101 Lesson Plans". I don't recall what he added, but I hope it was "don't follow these plans but use them as templates for your own lessons." Thank you so much for publishing this excellent essay. I regularly read your blog here, Chris and I want to thank Dr. Savonick for agreeing to share her work with a wider public. As a Humanities scholar who doesn't attend MLA (I'm in Art History), I wouldn't get to hear about this kind of work, much less read it. And I'm very glad I had the opportunity. In fact, reading about these examples of pioneering writers/teachers has inspired me to begin to re-think how I can better teach my students by incorporating some of the things that Dr. Savonick discusses. For me, this dovetails with the work of John Warner, whose reflections on teaching I've been following for some time. He's on Twitter these days talking a lot about his latest book, Why They Can't Write. John talks about how to make writing projects meaningful for students so as to encourage deep learning and engagement. Dr Savonick's essay here helps me see that this kind of work can also be used to empower students from marginalized communities as part of a critical race pedagogy. I'm a long-time lurker and first-time commenter. I was just so annoyed by the above two comments that I wanted to let you both know how insightful and inspiring this work is. Thank you. New Governor, New Higher Ed Support?